A production company producing plays, comedy, storytelling and poetry. Writer? Actor? Comedian? Poet? Get in touch! 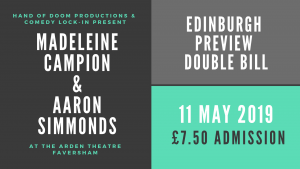 Join comedians Maddie Campion and Aaron Simmonds as they preview their Edinburgh Fringe shows. Hot gossip about a ghost, Mississippi and the paper clip from Microsoft word. Directed by Thom Tuck. See this VAULT Festival sell-out-show before it heads to Gilded Balloon at the Edinburgh Fringe. Maddie Campion is a Made in Kent comedy competition runner up, and was shortlisted for the BBC New Comedy Award 2018, “Very inventive and dry writer” ⭐️⭐️⭐️⭐️ Funny Women. Her 2018 Edinburgh Fringe show was developed through Soho Theatres Edinburgh Lab and received coverage from The List and The Times. Join the 2017 BBC New Comedy Award finalist and wheelchair enthusiast as he tells you about how his first paid gig led to him performing on BBC2 a year later, and what happens when you are being trolled online for not being disabled enough. Aaron is far better at stand-up than standing up and his unique perspective on life – usually of people’s belly buttons – gives him a distinctive edge in his performances as well as a sore neck. Always wanted to write a play? 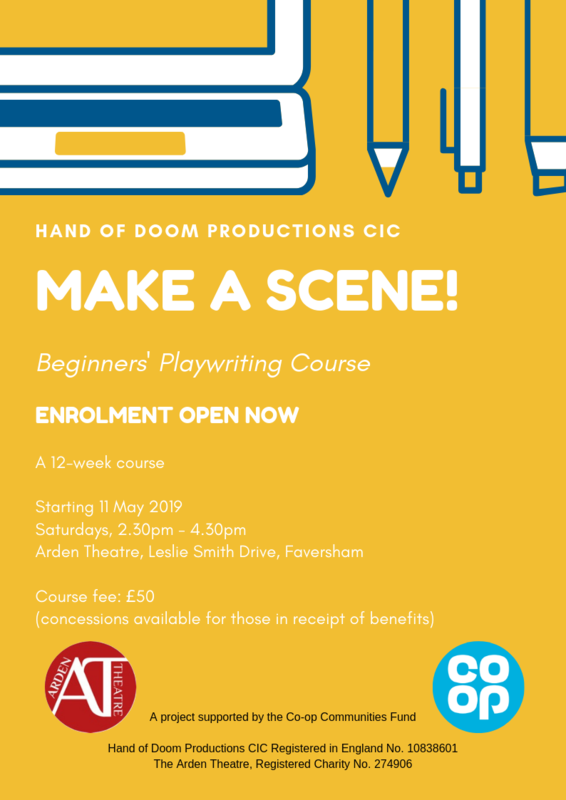 Then you might be interested to hear that we have secured funding for a community writing project to give Faversham the chance to ‘Make a Scene!’. With the support … Continue reading "Make a Scene! playwriting course"
Join comedians Maddie Campion and Aaron Simmonds as they preview their Edinburgh Fringe shows. MADDIE CAMPION: TRULY MADDIE DEEPLY Hot gossip about a ghost, Mississippi and the paper clip from Microsoft word. 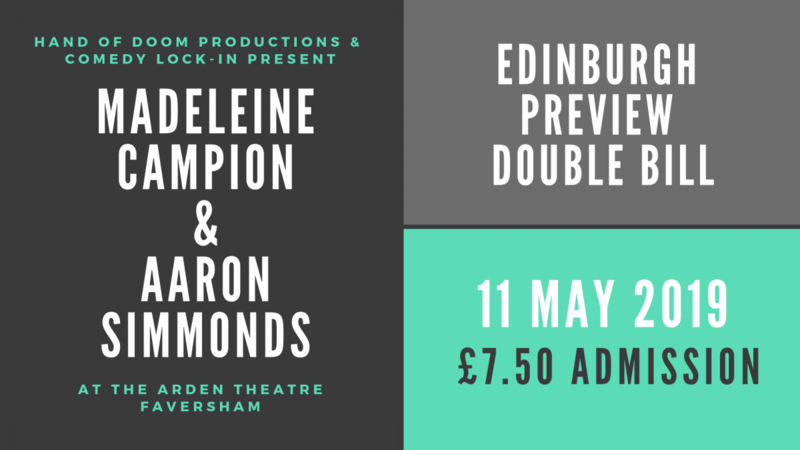 Directed by Thom … Continue reading "Edinburgh Preview Double Bill: Maddie Campion & Aaron Simmonds"
Join comedians Tom Toal and Josh James as they preview their Edinburgh Fringe shows. 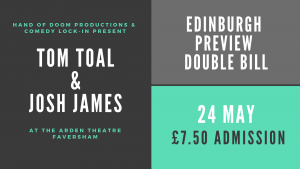 TOM TOAL in MEDIOCRE BOY One of the brains behind the After All This Time Always Podcast previews his brand new … Continue reading "Edinburgh Preview Double Bill: Tom Toal & Josh James"